We didn't get up all that early, despite good intensions. I ended up being unable to face the hotel's free breakfast, wanting something from Dunkin' Donuts instead. So we walked the four blocks to the Dunkin' Donuts where I got donuts and coffee, Jet got some hash browns, and John got another coffee. So the last morning on vacation was, in that respect, like our first. We wandered down the Boardwalk in the other direction this time and I got to see some things I didn't expect, at all, given the high-end treatment of the casino part of the Boardwalk. The first unexpected thing was the Casbah. It's something I've only heard of in songs, and I never thought there actually was one. But it turns out there is, and it's now connected to one of the Trump casinos, but it's still a dance club with all the trappings thereof. 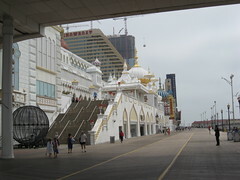 Behind it is The House of Blues here on the Boardwalk of Atlantic City, and on the front door is emblazoned "Unity in Diversity". I was quite taken by that. We also found clean beaches, filled with swimmers and surfers even at 10 in the morning. The sand was cleaner further down, with fewer sea shells and jagged edges, and Jet and John and I took some time to really dig in and put together some castles, walls, and sand balls for the fun of it. It built really, really well, and there was a sign saying that they often had sand castle building events at this beach, and we could see why. It's was fine and dense and lovely to dig in and build and carve. A bit of shell made clean, sharp overhangs easily. Jet lamented waking up so late, as he really wanted to have been able to put on his swim suit and really get into the waves and sand and water and then get back to the hotel so that we could shower, but we had to leave at 11:30 to make it to our flight (we had some margin built in, which turned out to be a good thing). The other surprise for me was seeing the Iron Pier. It's a huge carnival on a pier, with every conceivable ride and then some, including a motorcycle on a high wire near the entrance that we all contemplated in awe. There were food stands at the entrance, all carnival foods, funnel cake, candy apples, deep fried everything (snickers, oreos, ice cream, and bananas as well), and pizza. What really amused me was seeing a sign saying "We are not responsible for the seagulls. We will not replace stolen slices." The seagulls are indeed aggressive at Atlantic City, I guess. Watch out for your slice. I've seen carnival-like things in San Diego and Santa Cruz. I've seen boardwalks all up and down the West Coast, and along the gulf. None of them are like this, though. Not nearly as wide, nor with hundreds of little shops all alike and all thriving enough to stay open. But there aren't the sheer number of people, either. The beach in CT had eight huge parking lots, each of them bigger than the one parking lot at Torrey Pines beach, and they were all filled to brimming, that beach had people so packed in that they practically had their towels lying, edge to edge, with everyone else's towels, and that was on a state beach where folks paid $20 to get in and the sand was crummy and the water flat and there were rocks everywhere under foot. While I've seen lots and lots of people at Mission Beach and Pacific Beach, with their creamy smooth sands, it isn't like *that*. It's amazing to think about the sheer density of population here. Given the sheer amount traffic, it makes some sense. There just are so many people, that the traffic gets thick and dense. Our ride back to Philadelphia went just fine. There was one construction merge that got hairy as it took a lot longer than I was expecting, simply from the sheer volume of traffic trying to funnel into one lane. We got to the airport in good time, not great, but we had enough. We got through security quickly. And the boys found a market that had cold sandwiches, hard-boiled eggs, and chips of various types. I wasn't into having a cold sandwich, even though I knew whatever I got would congeal in the wait to get on the plane and taking off, but I ended up with a Cuban sandwich, pickles and spicy spread and all. It turned out to be spicy and sweet and really tasty even just warm instead of hot. I need to figure out how to make one of those. Our Southwest flight started out of the gate 15 minutes late, due to it being completely full and two little girls had to use the bathroom at the start. That was... bemusing. But we ended up getting to Denver 20 minutes early after a 3 hour flight. Early enough that we were able to do bathroom stops and get our luggage and were just in time for the AB to Boulder. The bus ride was another hour, and we ended up in Boulder, right next to the Walking Mall, we stopped for pizza slices (no seagulls), and got back to the Boulder Station in time for the BOLT, by ten minutes. It got us near home by 8:10 pm Mountain time (10:10 our time) and a neighbor was nice enough to just pick us up from there. She said that it was 'cause we were always so willing to help her out, and it was just really nice to not have to walk the mile home, though, as Jet said, we could have. Jet went right to bed. John and I did some unpacking and got things settled. A couple who was having surgery in Boulder had asked to house sit for the first week of our trip. They were friends of friends, and we were kind of leery of that, but decided that we might as well help them out. They left a very nice, long note, about how much they'd enjoyed the peace and quiet, the back yard, and my espresso machine. *laughs* They also left two of their books on their bike travels through South America and the Amazon, and I suspect they'll be very good reading in the long term. Heck, anyone that can "vacation" in South America for 4 months on $1200 dollars has got to be doing pretty well. The house was in great condition, what with the fact the cleaners got two goes at the house while we were gone, and Jet's little cacti, far from being unhappy at not getting water for a week, were green and very happy. The corn plants are now all taller than Jet, and the tomatoes are all showing huge amounts of green fruit. The many many zucchini plants are showing flowers everywhere, and the poblano chili plant has so many chilies on it it's falling over. I think I'm going to have to put a cage around it to support it. It was amazing being able to get back into my own bed. I enjoyed the adventures and the whole vacation, but I'll have to admit that I love getting back to my own bed. We spent most of today just coping. We were all up at about 6:30 am, still shifted, and John had to get into the day shelter for the morning. Jet and I played video games and did a mountain of laundry. He and John built a ship in the afternoon while I tried to get caught up on some things. I called the Verizon store about getting my replacement phone, but they routed me to support when I rambled about why I was calling. John had much better luck later, when he called, they said that they had two of the phones at the store, but when he and Jet went to pick it up, they found one of the phones already sold and the other put on hold for someone else. So they ordered my new one, which should arrive on Saturday with instructions on how to return my old one. So that's useful. I got in a massage with Bonnie, and after all the strange beds, I needed it desperately. The boys made dinner, steak and potatoes and corn, and we'd all gone shopping at the grocery store to restock everything. It seems a little crazy for us to already be looking at the end of summer, but Jet's back in school in less than a month, now. Summer has a somewhat different pace here. The schools are finishing up right about now, and there's about a 6-week holiday season ahead. This is the time that those of us without school-age children find ourselves popular with our employers for choosing not to go on holiday during this time, freeing up the time for those with kids, and saving ourselves a bundle, since costs go up tremendously as well. Very different pace. We're more than halfway through our three months off. I remember those days. *laughs* Before Jet we used to do that a lot, too, it was a lot easier to stay home then, and NOT brave the crowded everything. Thank you! And, yes, the garden is really going great guns... whew. Wow. I've never been to Atlantic City despite growing up in CT, and it's fun to see it through your eyes. What a cool trip. It is so very, very satisfying. Whew. It's fun to see places I've never been... it's been a wonderful trip. 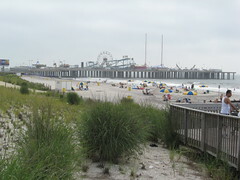 Ah, I remember the seagulls of AC--heck, all along the Jersey shore. They have no shame whatsoever! And the sandcastle building! Yep--awesome stuff. Yeah. Seagulls are rats with wings, too. Just far more aggressive sometimes than can be believed. Oh that seemed like such a lovely vacation. I was sorry to hear you and John were a little under the weather for most of it. Yeah, *laughs* I'm close to the wig-out stage. *laughs* I *like* being home after being away for so long... and do need some down time between trips. Otherwise we would probably have stuffed San Diego in between the East Coast and Wyoming... Gah. Air fares are incredibly low this year, I think because of the oil prices plummeting, which is part of why we're just running around like made people. It was a wonderful vacation, and being sick seemed just part of it this time around. At least in going to Seattle I brought my Airbourn. Whew.